Like a lot of other nuclear engineers, I went to see Pandora's Promise last night. It's a documentary about the benefits of nuclear power, and is touted as an "Official Selection" at the 2013 Sundance Film Festival. (I'm not sure what that means. It doesn't appear on the list of award winners, for instance. Perhaps it's a fancy name for "participant"?) There were lots of other fellow geeks and nerds in the audience, and people were glowing about it afterwards. Unlike a lot of other nuclear engineers, I was disappointed. Saying such a thing is a bit of heresy in many circles. I admit, it's a nice, entertaining, and enlightening 86 minute documentary. But as for its intended purpose? It misses the mark, guys. For the past three years I have devoted almost every waking moment to taking these ideas and shaping them into a documentary about what is perhaps the biggest and most unwieldy subjects imaginable: how do we continue to power human civilization without destroying the environmental conditions that has made modern civilization possible? Look, there was an impressive amount of momentum behind this thing. Just two years after the Fukushima nuclear accident, here was a movie that potentially could appeal to the masses and change the public opinion on the importance of nuclear power. This was intended to shape the dialogue. I don't think it's going to move the needle a bit. Where are the pithy one liners? Where are the memorable moments? Where are the quotes that people will re-use in everyday conversation? The documentary may sway a few open-minded people who happen to see the show and perhaps question some previously held beliefs. But its message will not get across to other folks at the water cooler, at the lunch table, at the sidelines of a soccer game as parents are watching their kids play; the documentary provides no entree into those areas. Those are the elements that will really shape the dialogue today. And it missed. The projections of energy use in 2030, 2050, and 2100 were interesting, and the CGI graphics of the earth spinning and lighting up more and more were neat. 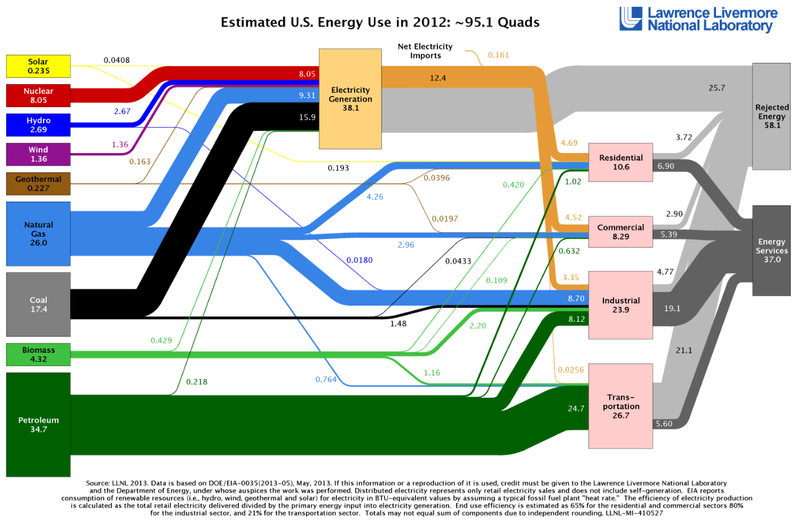 The pie charts of fossil fuel use vs. everything else were instructive. And the pictures of Hyman G. Rickover explaining to the world the basics of how nuclear power propelled a submarine were memorable. But we've had all those before, and they just don't seem to gain much traction. The movie was entertaining, but it didn't tell a story that was any more compelling than Lawrence Livermore's Sandkey charts. 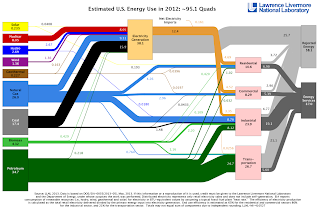 LLNL's Energy Flowchart. Seriously, take a minute with this one. The amount of energy we lose is staggering. At the end of the day, each new nuclear power plant will take approximately 10 years to build and $7 billion to construct. There is no way your "average" utility can sink those kinds of resources into power generation -- and that's $7 billion that has to be sunk before you can pull rods and start generating power. It's a tough sell to put $7 billion worth of eggs all into one basket, and only then can you begin making money. It's just an insurmountable up-front cost. Which is why I'm a little more hopeful about small modular reactors. As a nuclear engineer, I hope that SMR's can provide a lower up front cost as well as get political support because the entire thing can be made domestically. (Admittedly, it remains very much unclear if the resulting product can generate power at a reasonable cost.) Pandora's Promise talked about energy executives deciding to build a new nuclear power plant over a golf game; they could do that because the things were so cheap and easy to build in the 1950's and 1960's that many utilities could afford them. Fossil fuels will continue to be favorable until either the cost of generating CO2 goes way, way up, or the cost of building nuclear goes way, way down. But, despite all this, go see the movie. It's at least worth the price of admission.